1. Your bio - include whatever contact info you’d like to share - website, twitter, etc. 2. What’s your comics background? What projects have you done? Why comics? I’ve been a professional cartoonist going on twenty years or so. Originally, I started out doing a comic strip online (Plato’s Republic 2000-2008) and I submitted it to syndicates in the hopes of getting syndicated (I have LOTS of rejection letters). When I started doing Kid Beowulf, it was a fun little distraction, but the more I worked with the story the bigger it got and so I shifted gears to more long-form storytelling. It’s had a long history in self-publishing and traditional publishing and I’m happy with its new home at Andrews McMeel. I started working at the Schulz Studio in 2007 and have been lucky enough to work on a number of projects, including the monthly PEANUTS comic book series published through BOOM Studios. That’s been a terrific series to edit and be a part of and has informed my own creative process. As to why I chose comics, I think like a lot of cartoonists, comics chose me; it was the one art form I’ve always gravitated too since I was a kid. I love learning about its history, how it works as storytelling, I love the variety of cartooning styles and languages. It’s an endlessly fascinating art form and I’m proud to be a small part of it. 3. What do you see as the value of comics in education? I think education is about disseminating complex ideas to students that will (hopefully) spark further exploration by those students of those subjects; it’s not about giving the answers, it’s about igniting curiosity. We’ve always been a visual culture but I think in recent years that’s only increased and the visual language of comics is the perfect medium to help break down complex ideas and help represent them clearly; whether it’s math, coding, science, or literature. Comics are a great tool for any teacher to have in their arsenal. They can tackle hard ideas on their own or be used as a bridge to more complex learning. 4. Explain the process of creating a comic adapted from widely known stories in our culture. What are the inherent difficulties/benefits of this type of storytelling? For me, first and foremost, I want to tell a good story and create interesting three-dimensional characters who live on the page. I’ve always loved these old epic stories and long before they became the subjects for professors and PhDs they were stories told around a campfire and that’s how I like to approach my retellings. When I begin, it all starts with the source material (in this case the Spanish epic poem El Cid). I read several different translations several times over and try to pinpoint the themes. I also read essays and critical texts on the poem to understand how it’s been interpreted. Then I read a variety of history books to try and understand the culture of the time. All the research goes into a big melting pot of ideas and that’s when I start to craft the story. Sometimes ideas I really loved at the start don’t make it into the final version, other times characters start dictating the path of the story. With historical epics, I sometimes get trapped by geography. For instance, in the original notes of El Cid, I wanted the final confrontation to take place in southern Spain at an early “Red Fort” version of the Al-hambra, I thought that would be a symbolic convergence of people, themes, and religions. I soon realized that I could not get all the key players there convincingly to make that setting work so instead I moved the finale to central Spain, in Toledo, which ultimately worked just as well, still made all those themes resonate, and was more natural to the storytelling. 4. What’s your favorite panel/page and why? That’s a tough one. Artistically, I feel like my style started to come together with book three, so there are several bits I like. My favorite might be the opening of part two, it’s a flashback to Rodrigo Díaz’s (El Cid) youth and I tell the story of how he got his famous horse, Babieca. That was a fun sequence to do and I think the drawings of the horses turned out okay (horses are really hard to draw). 5. What specific projects have you worked on that would be great for classrooms? 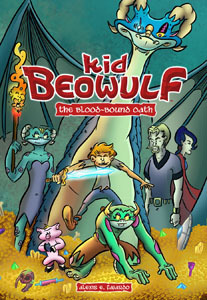 I think the Kid Beowulf series would make a good fit for classrooms. If teachers have students who enjoy George O’Connor’s Olympians series or Jeff Smith’s Bone books, I think they would like Kid Beowulf. (My own kids love these books and Kid Beowulf, so I can personally attest to this fact – Tim) What I really like about the color editions from Andrews McMeel is the backmatter we put in each book, they’ve got character glossaries, maps, key terms, fun facts, and a bibliography. Ideally kids could read the story for fun on the first pass and for those students who like to dig a little deeper we’ve given them those tools to do so. 6. What advice do you have for educators on how to use your comics? Gosh, that’s a great question. I think ultimately, I would encourage teachers and students to read the stories and just talk about them, maybe identify what themes resonate with them, which characters pop out to them, what drawings they liked and why. I know I pack a lot into these stories (with varying degrees of success), but I try to put enough in them that something about the tale will resonate with any reader, whether it is a specific character, idea, or drawing. I never want to be overly didactic with the books I write, but I do want them to be dynamic and fun. Thank you so much, Lex! I have a great admiration for the level of research you have put into your books and the funny and engaging way you have illustrated them. The publisher of Kid Beowulf has also created teacher lesson plans to go with the books - check out http://kidbeowulf.com/kid-beowulf-teachers-guide/ - these were written by Tracy Edmunds - an amazing educator and friend. I have also written a review of the book here - http://www.historycomics.net/featured/ . See some images from his newest book below - I personally chose them as they speak to the value of this book in our classrooms. I am so excited to share the very first of the creator interviews as it is with a person who inspires my kids and myself. 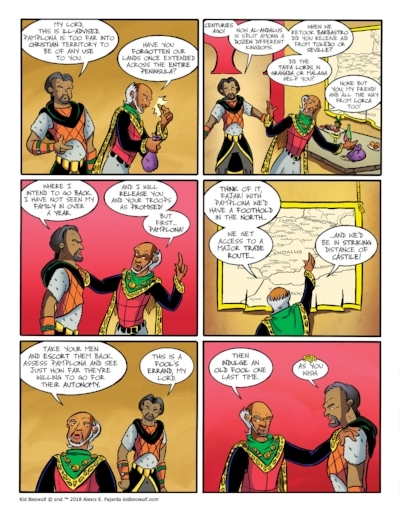 Dwight MacPherson has published his own comics through HPComics and saw a need for his medium through his own son, much like I began my journey as inspired by my own son, Liam. This interview blog will be populated by creators whose work I find perfect for the classroom and that I personally enjoy. I will not be reaching out to folks just because - the amazing people you find here will be those who I personally find inspiring and who are just good people. I was honored to have Dwight and his amazing wife, Rebecca, reach out to me and ask that I do some educational outreach work for them and their comics. It is truly a blessing when you are asked to "work" for people whose work you already admire. Dwight sees so much value in creating comics for the classroom and there are so many great adventures on the horizon! If you have any follow up questions, feel free to email me (historycomicsguy@gmail.com) or follow Dwight and HP Comics and ask them yourself - @D_MacPherson and @HPComics_ . We are working collaboratively to create teacher lesson plans and guides for all of his comics - James Caudill is also an amazing comics educator who is working with us as well - follow him on Twitter @TeachCaudill. Seriously - Dwight and Rebecca are good people - they make me laugh and make me think - they have a deep love for each other that shows through in their dedication to comics and education. They also serve as an inspiration to those looking to break into the comics industry as they just keep on keeping on and creating comics that they find value in. This is not about chasing the almighty dollar or for humongous fame - they create because they believe. I can think of no better story to share with my children and students than what they have accomplished and are planning for the future. Q. Can you tell us a little about yourself and your background? A. DLM - I'm a Michigander by birth, but my family moved to Florida when I was 9 years old so I grew up there. I proudly served as an Army Medic for 14 years until I was medically separated. During my time in the Army, I did tours in Saudi Arabia and South Korea. I wrote my first comic, 'Dead Men Tell No Tales', at Camp Casey, Korea, and it is this graphic novel that lead to me meeting my amazing wife, Rebecca. She purchased 'Dead Men' when she was living in Hollywood and working as an independent producer of theatre and film. She contacted the publisher, who in turn passed on her information to me and two years later, we became husband and wife. We have 3 sons: Clayton, Duncan, and Logan, who are our biggest inspiration to write the best stories that any reader--of any age--can enjoy. My work has been published by DC Comics, Image Comics, IDW Publishing, and many others. We started Hocus Pocus Comics a little over a year ago and we already have three comic series on ComiXology and Amazon Kindle and four successful Kickstarter campaigns under our belts. You can find us at our website, hpcomics.net, on Twitter (@hpcomics_), Facebook (www.facebook.com/hocuspocuscomics), YouTube (www.youtube.com/channel/UCJxIKAGhiJrnzYgqBYlX1pw), and on Instagram (www.instagram.com/hp.comics/). Q. What’s your comics background? What projects have you done? Why comics? A. DLM - Wow. There are so many. [laughs] The projects that I'm best known for are 'Sidewise,' 'The Surreal Adventures of Edgar Allan Poo,' 'Kid Houdini and the Silver Dollar Misfits,' and 'Dead Men Tell No Tales.' My very first comic, 'Dead Men Tell No Tales' #1, was published by Arcana Comics in February of 2005. 'Sidewise' is an original digital project that I created for DC Comics' Zuda imprint. It's still available in DC's shop and various digital comics sites. 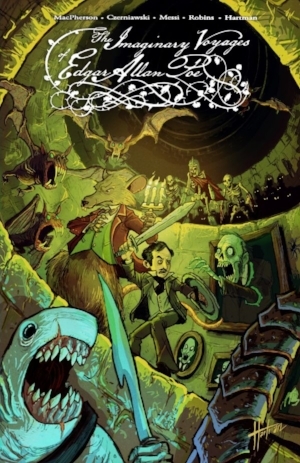 'The Surreal Adventures of Edgar Allan Poo' was published by Image Comics in August of 2007. I received a Harvey and Eagle Award nomination at the time, but ultimately lost to Perry Bible Fellowship's Nicholas Gurewitch and Alan Moore. Yes, THAT Alan Moore. 'Kid Houdini and the Silver Dollar Misfits' was published by Viper Press in June of 2008. I'm also the co-creator and co-writer of the Howard Lovecraft trilogy with my good friend, Bruce Brown. Two of the books have been adapted into films, but I had nothing to do with them, so don't blame me. [laughs] In addition to these, I've written a lot of short comic stories and edited many comic series. You can find an exhaustive list of my work at http://www.comicbookdb.com/creator.php?ID=2737 and my Amazon Author's Page: www.amazon.com/Dwight-L.-MacPherson/e/B00355KG1K. Why comics? Well, they're in my DNA. Some of my earliest memories are of me reading, drawing on (yes, I got many spankings for it), and making my own comics. I love the medium. I've always said that comics are the marriage of literature and art. They engage the senses and stay with you forever. The good ones, that is. Well, to be honest, I can still remember many of the bad ones. Kinda like the way that I can't forget Toni Basil's 'Oh, Mickey' no matter how hard I try. But seriously, I credit comics as the catalyst for my lifelong love of reading. Q. What do you see as the value of comics in education? A. DLM - Well, as I said, comics were the catalyst for a lifelong love of reading. Let's face it, text by itself can get boring. Especially when it's the dry, academic writing found in text books. But add pictures to the text and voila! It's an experience. It engages the senses. Bright colors, humor, engaging dialogue... I think it disarms readers who shun the type of text I've mentioned. And I've seen this demonstrated in my own household. My middle son, Duncan, suffers from Asperger's Syndrome. He had zero interest in reading when he was little, so I bought several comics for him. He gobbled them up. I even created 'Kid Houdini and the Silver Dollar Misfits' just so that I could give him even more of a reason to read. It worked. Duncan is now 20 years old and a voracious reader. I guarantee he's more well-read than at least 90% of the young people his age and has read more of the classics than many people twice his age. So, having said that, I believe that we are just beginning to understand how valuable the comics medium can be in the classroom. (So inspiring! - Tim) Various studies are beginning to bear this out, and I only see comics becoming more pervasive as educators see the studies and introduce comics into their own classrooms. Q. What specific projects have you worked on that would be great for classrooms? Kid Houdini is another book that is wonderful for the classroom. The book is out of print, but we are currently preparing to release a new printing of the first book re-titled 'Kid Houdini and the Lost Goldmine.' This book has been aptly dubbed "Scooby-Doo meets the X-Men." Teenage Harry Houdini teams up with a group of circus performers to solve supernatural crimes. This book addresses topics like disabilities, friendship, critical thinking, and many more. I was pleased to learn that several universities have used the book as curriculum for Special Education majors. Q. What advice do you have for educators on how to use your comics? Q. What new projects do you have coming up? A. DLM - The only project I can talk about at the moment is called 'Houdini's Silver Dollar Misfits.' It's about a very special orphan who teams up with his ragtag friends to solve the mystery of who he is and where he comes from. Once again, I believe this book will be extremely useful in classrooms for addressing several topics, not the least of which is orphans, friendship, families, critical thinking, empathy, and what it means to be human. What I love about the Houdini books is that the central message is this: "Imagination is magical." If I can inspire the future generation to dream and create, I would say that my life has been a success. Q. Describe the process of writing about figures who are widely known. What are the difficulties/advantages to the process? Any more challenging than the traditional superhero genres? Any more pressure to "get it right?" A. DLM - Well, the first thing that I do is conduct a Google search to make sure they're in the public domain! [laughs] After that, I scour the internet and public libraries to find biographies, letters, and other historical records that tell me more about the person/people I intend to write about. When I feel I've done my due diligence to research the person, place, and other relevant information, I build a story skeleton and then begin writing my script from there. Well, the difficulty in writing Poe is that we honestly don't know a lot about him in comparison to other writers of his time (the popular writers). He didn't keep a journal, or it hasn't been found. Not much of his correspondence has survived, or it has not been shared with the public. So it's kind of hard to get a concrete sense of who the man was, what his motivations and frame of mind were at certain points in his life, and so on. This only adds to the mystique of Poe--which I think is good--but it requires a writer to really try to get inside the author's head. To go out on a limb, if you will, and fill in the blanks. This gives you freedom, yes, but on the other hand, it gives room for others to say, "Poe would never say/do that!" We all fill in the blanks and sometimes we don't match up. It's definitely more challenging to write historical fiction than traditional superheroes. I've written two superhero books, and it was a blast. Little or no research, I could do whatever I wanted! With franchise superheroes, however, you will be reading a huge stack of comics poring over continuity. And that can be a pain. With historical fiction, you are looking at a ton of research if you do it right and the process can be slow. There's definitely a pressure to "get it right" in both unless you're writing a new superhero book and introducing characters. Then it's wide open and a whole lot of fun. Q. Why Poe? Why Houdini? A. DLM - I found Poe and Houdini particularly fascinating when I was young. I first heard of Poe in the Roger Corman films from the '60s. I watched those great old films with my dad and they scared the heck out of me. So when I saw his name on a book in the library, I was intrigued. Over the years I've conducted extensive research of the man as well as his work, and, once again, it is the shroud of mystery that still lingers over Poe that drives my fascination. In the case of Houdini, I first saw 'In Search of... Houdini's Secrets' on television and was fascinated. Once again, as I grew up and studied the man I became fascinated by many of the things I found out about the man. An immigrant who came to America with nothing and became a rockstar? Amazing. And when I learned that he was friends with Sir Arthur Conan Doyle and H.P. Lovecraft, I was hooked. Both of these men are legendary!